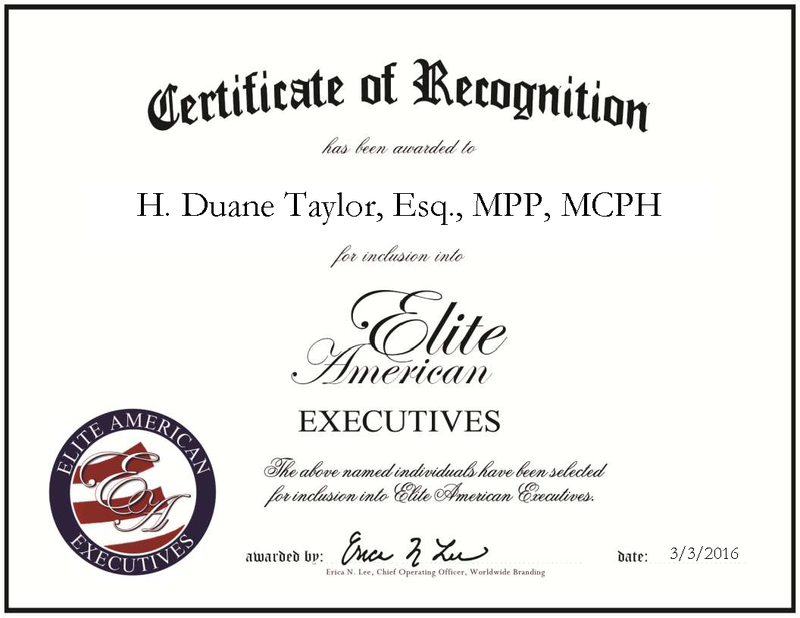 Lanham, MD, March 3, 2016, H. Duane Taylor, Chief Executive Officer with the Mid-Atlantic Association of Community Health Centers, has been recognized by Elite American Executives, for dedication, achievement and leadership in health care management. Driven by compassion, H. Duane Taylor has dedicated his entire career to finding different ways to help people. At the present moment, he serves as the chief executive officer of Mid-Atlantic Association of Community Health Centers, a health care organization that represents 30 community health centers across Maryland and Delaware. In this position, he lends his expertise in change management and turnaround to implement leadership development solutions that enhance organizational performance. He is also responsible for supporting the legislative, strategic, finance and bio-terrorism committees. Prior to becoming the CEO, he served for nine years as the organization’s chief operating officer and chief financial officer. In addition to his position with MACHC, Mr. Taylor is also a barred attorney in Maryland, a health strategy and management subject matter expert, a motivational speaker, trainer and executive coach. Long before securing a leadership role in the health care industry, Mr. Taylor interned at The University of Chicago Hospital while pursuing a Ph.D. in public policy. Although he was conducting sickle-cell research at the time, he couldn’t help noticing the amount of health care professionals who dismissed African-American patients that were in pain, reasoning that they were merely seeking drugs. It was then that he chose to redirect his focus to an area that would allow him to address this very real problem in a more substantial way: health care management. At the present moment, Mr. Taylor is pursuing a doctorate in public health through George Washington University. He also holds a JD in international law and health law from the American University, which he received in 1997, as well as a Master of Arts in public policy from The University of Chicago. He also manages two other businesses: Taylor-Wilks Group, a health care consultancy, and Motivation Now, a coaching company. As he moves forward with his career, he aspires to run an international health organization and live abroad. This entry was posted in Health Care, Uncategorized and tagged change management, health care management, health law, international law, leadership development, Mid-Atlantic Association of Community Health Centers, organizational excellence. Bookmark the permalink.